I was a rebel kid. I was the kind of kid who hated all convention but had a divine love for the peculiar. For example, I hated football and absolutely loved John Waters. I suppose many kids of the 90's took the very same approach to life, but with age comes the need for variety wisdom. I slowly got bored of listening to Nirvana (my kid self would slap me for saying that) and opened up to the idea that I could still be rebellious and have a crush on the star quarterback. And I am SO happy this revelation came in time to enjoy the Super Bowl last night. Even though I found a love for football hidden deep within my mutinous psyche, I still like to avoid fanatical football fans. You know, the guys that climb light poles and set fires. You know… those guys. 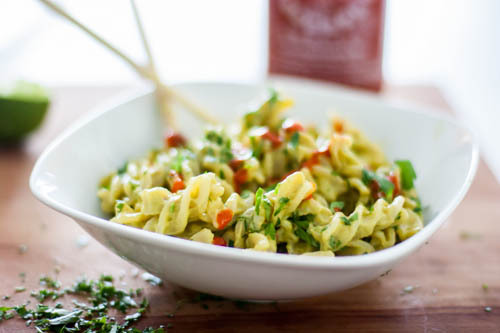 I could not brave the wild crowds yesterday, so I stayed home and threw together a mini feast starting with this creamy avocado Thai basil pasta which only takes minutes to make. I have been tweaking this recipe for awhile adding spices here and playing with flavors there. It turns out the true beauty of this pasta dish shines when a more modest approach is taken. Take the conventional avocado and make this inspired dish, It will help feed your inner rebel. 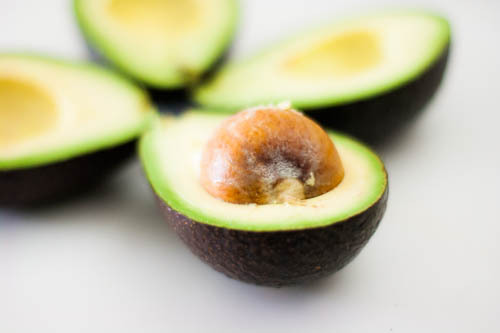 In a blender or vitamix combine avocado, lime juice, coconut milk, garlic, jalapeno, salt, and Thai basil; blend until smooth adding extra coconut milk until you have reached desired consistency. In a large bowl toss pasta with the sauce. Serve garnished with chopped basil and a liberal dose of sriricha. For those who want a little more protein this is delicious with crumbled bacon or shredded chicken. I've made some avocado-based creamy saces before, but have no clue why I never thought to do it up Thai-style. Defintiely trying... maybe with some fresh ginger too? Oh this is definitely a super bowl of pasta. I think summer has arrived early! I love me some avocado made into a sauce or dressing! I don't know why I never tried it before last year ... so simple, so good for you! Thanks for this new variation. Wow this sounds incredible, what a great combination of flavors. Can't wait to try this, thanks for sharing! Mmmmmm.. This must be yummy. I had tried using butternut squash for making pasta sauce and it was very well received... Avocado should be quite close in style... Like! I never cook with avocado, usually I use it for salads. Your dish look very happy-)) With a lot of colors, well done! I forgot to tell you that I love your new profile picture very much. It looks amazing! I've never thought to use avocado as a base for pasta sauce... great idea! Oh, boy, does this look tempting, Kimmi!!!! 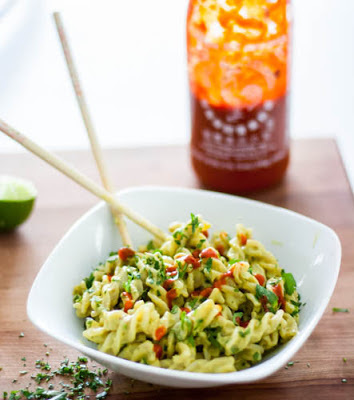 I love the Thai flavors and that you've used yummy avocados to make a creamy sauce...delish! I love avocado! this pasta dish sounds incredible! What a clever use of avocados. I really should utilize them for than just guacamole. I love the Thai flavors too.. YUM! I've been back and forth about wishing I still lived in Baltimore and being glad I'm away from the craziness. This pasta looks absolutely wonderful! I love that everyone is so in to Baltimore sports, but let's keep the violence and silliness to a minimum... animals! lol. My hubby requested this dish again last night so I think it's a definite winner. We're huge pasta eaters in our house but making it Thai style and with avocado? This looks amazing! I have to try this - my family would adore it. Wonderful colours at this wintery time of year too. Thanks! My hubby requested this dish again last night so I think it's a definite winner. Sometimes I buy a big bag of avocados and try really hard to use them up. I didn't think about using for the pasta option! Great idea and I'd definitely give this a try. I'm thankful for variation in pasta dish as I'm tired of my own creations. ;) Looks delicious~~~! This sounds so clean and delicious! I'll need to get my hands on some avocados ASAP (they're unfortunately kind of expensive here in Thailand!) and make this. Thanks for the great recipe! What a beautiful pasta dish. Yeah, I love to twists things up and fine tune and recipe for trying different things and very often, less is more. My kids and I love creamy avocado and I can't wait to give this a try. That is a great, unusual use for avocados--and that top photo is so lovely that it makes me rethink my (irrational) dislike for them. Yum! I'm SO going to make this!